The United States will give Iran access to another $2.8 billion over the next several months and appears to have conceded to Iran’s demand that it be permitted to domestically enrich uranium, the key component in a nuclear weapon, according to senior Obama administration officials. In exchange for agreeing over the weekend to extend nuclear talks until late November, Iran will be given another $2.8 billion in unfrozen assets, the White House told reporters over the weekend, after President Barack Obama decided to extend the talks past their July 20 deadline. The United States already returned to Iran $4.2 billion in unfrozen oil assets during the past six months of the interim nuclear deal and has now agreed to provide another $2.8 billion in exchange for an extension in the negotiations. White House officials also appeared to admit that U.S. negotiators have told Tehran that they will allow it to preserve some of its domestic enrichment capabilities, something that Congress has opposed. "As part of the JPOA [Joint Plan of Action] extension, Iran will be allowed access in tranches over the next four months to $2.8 billion from its restricted overseas assets," a senior administration official told reporters on a conference call over the weekend. "Those assets, which are largely unavailable to Iran, are more than $100 billion." These frozen assets have "actually increased" over the last six months due to increased oil revenues flowing into Tehran as a result of sanctions relief provided by the United States. "So they will get access to $2.8 billion from these restricted accounts, which is the pro-rated amount of the relief that was provided in the [Joint Plan of Action] period, which had been $4.2 billion," the official said. The United States also will continue to provide Iran with sanctions relief, including the suspension of sanctions on automotive imports, petrochemical exports, and gold trades, according to the White House. Regional experts continue to worry that the ongoing sanctions relief will allow Tehran’s economy to recover and build up a resilience to any further sanctions that may be passed in the future. Iran earned around $25 billion from oil sales during the six months of the nuclear accord, though much of that money remains in frozen accounts, the White House officials said. "The vast majority of that revenue has gone into restricted accounts. Some of it has been released as part of the agreement in the JPOA, and some of it can be used for bilateral trade or for humanitarian trade, but we think that the amounts that are building up in these accounts is—I can’t give you a precise figure on it, but the amounts are continuing to build up beyond the $100 billion that they had at the beginning of the JPOA period," the official explained. Mark Dubowitz, the executive director of the Foundation for Defense of Democracies (FDD), said the administration has greatly underestimated the amount of economic relief it gave to Tehran. "We estimate that Iran has benefitted from much greater economic relief than U.S. policymakers have acknowledged," Dubowitz said in a recent report on Iran’s improving economy. "While the Iranian economy remains under pressure, its stabilization and improvement in key areas has diminished the severity of the economic pressure on Iran’s leaders and enhanced their negotiating leverage," he said. 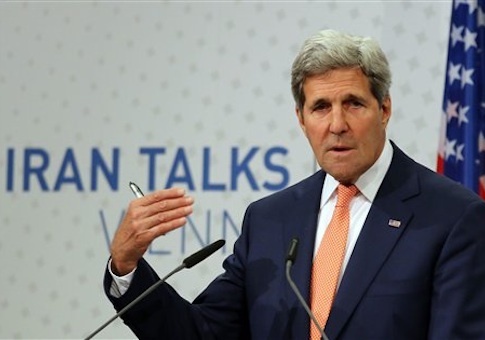 "This may account for the intransigence that Tehran has demonstrated at the talks in Vienna." Additionally, U.S. negotiators appear to have accepted Iranian demands that it be permitted to carry on a domestic nuclear enrichment program, according to the officials. Disagreements remain around the extent of this enrichment. U.S. negotiators "have highlighted the issue of domestic enrichment and the number of centrifuges that Iran would be operating as a part of the agreement as one very important remaining gap that has to be worked through," the administration officials said. Other so-called "gaps" revolve around Iran’s nuclear reactor and the future of some of its other sensitive nuclear facilities, including Fordow. Questions also remain about "the type of monitoring and inspections regime that would accompany part of a long-term agreement." Discussions also still need to take place about "fundamental pathways to a nuclear weapon" that might remain for Iran under a final agreement. Obama made the call to extend the discussions after consulting with Secretary of State John Kerry, the White House said. "It was President Obama’s determination out of that meeting that it was worth pursuing an extension, given the progress that had been made, and given the potential prospect for comprehensive resolution," according to the senior administration officials. Iran also has made some concessions. Tehran has promised to move "in a more expeditious manner" to turn its stockpile of highly enriched nuclear materials into a less dangerous substance. Iran also will move some of this nuclear fuel into the Tehran Research Reactor under the extended agreement. Additionally, Iran said that rotors meant for its advanced centrifuges—which can more quickly enrich uranium—will only be produced in nuclear facilities that international inspectors have access to, the White House announced. Iran also has committed to only use these advanced centrifuges to replace damaged machines, a move that White House deemed as "an important step forward."